This was first published on the Siftery blog, here. Elevio is a Customer Education Platform, that drives up engagement while reducing support loads for sites, by delivering the relevant help they need where and when they need it. Kevin William David interviewed Chris Duell, CEO of Elevio to know more. Can you tell us about what you are working on? What is Elevio? Elevio is a customer education platform, that uses the delivery of contextual support content to users where and when they need it to both increase education and engagement, while reducing support loads. We’re all about making it easier to get people to the “aha moment” for your product, you’ve only got a small window and once that’s closed… forget about it. Our software allows site owners to deliver timely and to the point guidance to their users, so they can get the job done. We then report back on where things are going well, and where they’re going not so well so site owners know where they can improve not only their documentation, but their actual product, to make sure all roadblocks and barriers to entry and ironed out. Tell me more about why you are building this? A few years ago, Matt (my co-founder) and I took over a job board that we rebuilt from scratch to make it fully automated end to end, and used that as a residual income stream. The main issue was that we spent quite a lot of time answer the same simple questions over and over. So we did like most companies do when faced with that issue, we filled up a knowledge base with everything we could think of, and when someone asked us a question we’d direct them to the answer in the knowledge base, in the hopes that when they had another question they’d look there first… they didn’t. 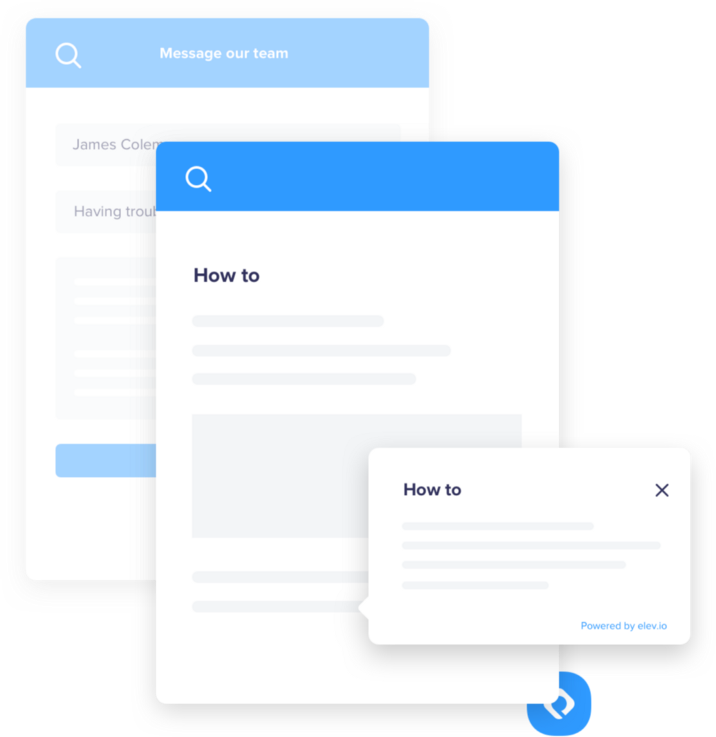 So, we decided if we couldn’t take the people to the content, we’d bring the content to the people, and so we built an MVP that would show related support content in a tab on each page, and our support loads dropped around 75%. That was enough for us to think others might get some use from this, so we spun it out as a standalone product, and have continued to extend and improve since then. How is Elevio different from what already exists in the market? We’re pretty strong believers that when people are better educated, they become more engaged, they become stronger advocates of your product, and they’re more likely to drive more value from your product, which leads to a longer relationship. Most support tools on the market make their money when support loads are high (particularly in per seat based pricing), we wanted to go the other way though and instead actively help you improve your product to reduce that support load, which is why we don’t class ourselves as a “support” company since it’s too reactive, but rather a “customer education” company. It brings a completely different connotation. Similarly, a lot of messaging tools like Intercom focus mainly on sales & marketing (which they do extremely well), rather than supporting and helping the user. We believe users need to be helped and guided where and when it makes sense for them, not when it makes sense for you, that’s what a lot of these messaging systems seem to forget in the hype. It’s almost as if as an industry, when it came to bots and firing auto messages we were too concerned about whether or not we could, we forgot to think about whether or not we should. It’s like the saying, if the only tool you have is a hammer, everything looks like a nail. That’s why instead we aim to surface and deliver the help the user needs, at the time they need it, helping them better understand and engage with your product in the context they are currently using it. It makes a huge difference when the user knows you’ve got their back and want to help them, rather than feel like they only hear from you when they’re being upsold to. Who uses Elevio? What types of roles do your customers have at their companies? We’ve got a fairly broad set of customers that make up our customer base, from universities to e-commerce, but our primary customer base is in the SaaS industry. Within that segment there’s two main camps, those that are looking to reduce their support load, and those that are looking to increase user engagement. Typically it’s the medium sized companies that are looking for a way to scale their support efforts without simply reacting by scaling their support team and increasing their expenses to play catch up. It’s often a product manager or founder that finds us in these cases, looking for ways to streamline and supplement their existing support efforts. Where as the much larger companies like the Fortune 500s we have on board have usually got their support processes down, and are looking to find better ways to on-board and get users to the “aha moment” in turn growing their revenue. So in these cases, it’s often someone from the customer success team that first comes across us before sharing with their team. At the time of writing, we’re at 500+ customers on board and growing at a good rate, with the likes of Dell, Staples, Atlassian, LiveRamp, AdRoll, Heap etc using us to help educate their customers. Have there been unique use cases for Elevio that you hadn’t thought of or expected? We’ve also had a few customers that have found ways to install our software into native mobile apps, it’s not something we even knew was possible… but it’s pretty cool to see. For us, since we take up real estate on our customers site with our embeddable a lot of our growth can be attributed to a small “powered by elevio” which is common place in embedded software. When someone clicks on that link, we make use of the knowledge of where they came from to present the user with a landing page that shows familiar names / logos to ease them into what we can do for them. Having potential customers come in through this channel converts much better for us, since that person has actually experienced our software as an end user, so they already understand how we can help them. Since we’re loaded on our customers sites, every page load from every customer that comes on board adds to our load, and we can’t know ahead of time when someone large would come on board. So in the early days, we did a lot of last minute hacks and tweaks to handle specific large customers so we wouldn’t be overloaded. After we grew up and were able to hire a team, we were able to build things “the right way” for scalability, but those early days it was like a duck on water… graceful on the surface, but flailing legs going flat out under the surface. 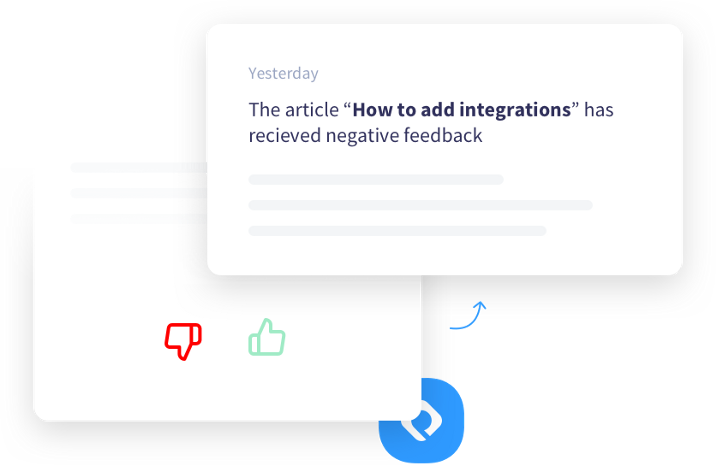 We’ve just recently rolled out integrations with Slack and Hipchat, so our customers can get real time notifications when their users provide feedback on a particular article. That way they’re able to make any necessary tweaks to their content, or their product, without wasting a moment and showing their customers how much they care with prompt movement. What are the top products that you depend on to run the company & how do you use them? We pretty much live in Slack for any ephemeral communications, with anything that needs to be more long form for storage or planning being stored in Basecamp. To help with managing incoming leads and nurturing, we use Pipedrive to keep things clean and organized. To help us in rolling out new features, we’re using LaunchDarkly. It’s great for releasing things first to just us, then to a select alpha team, then to a broader beta team, before a full public release. Still blown away with how fast it is. We’re also using Delighted to help us send and monitor our NPS, so we can make sure we’re delivering value to our customers, and to find out where we’re falling short. And obviously we use our own software to help with educating our user base, as well as reducing support load for the common questions and tasks.